Festivals Jerk Chicken Grill aims to make authentic, Jamaican cuisine accessible to everyone. Specializing in jerk chicken, festivals an island favorite similar to a fried dumpling and other traditional Caribbean cuisine with American flair, there's something for the most timid eater to the experienced Jamaican foodie. Rhen's Nest Toy Shop offers quality, creative, unplugged toys that stimulate children's cognitive, social, physical, and emotional growth. We use natural flours, sugars, and the very best chocolates, butters and fruits. We grind most of our spices and use only excellent liquor and liqueurs. We specialize in layer cakes, specialty cakes, cupcakes, cookies, cheesecake, macaroons, Gluten Free and Low Carb options. Chef Kevin Gillespie has created a home-like atmosphere where guests can eat what they wish as he prepares dishes from refined to rustic and sends them out to the dining room. Curated gifts of regional and gourmet items, bakery and cafe featuring Octane coffee and Honeysuckle gelato. Meals, desserts and a selection of sweet and savory baked items made in house. The Shed at Glenwood is a casual concept with serious food. Their “Farm to Table” approach has created a daily evolving menu full of seasonal surprises. We are a sensory friendly kids salon located next door to Relish Salon in Glenwood Park. In addition to cutting children's hair, we also host kid-inspired events, arts & crafts, story hour, movie nights and birthday parties!! Good eats, potent cocktails and friendly service in a fun and casual atmosphere. Open 7 days a week. A great selection of coffees, teas, cold drinks, sandwiches and pastries make Drip Coffee House one of Atlanta's favorite fresh brew destinations. Glenwood Park harvests approximately 35,000 gallons of water per week using a combination of storm water and well water - thus avoiding any use of potable water from the City of Atlanta for our drought resistant landscaping. During construction, Glenwood Park recycled 800,000 lbs of granite ruble blocks! That's enough material to build all of the walls in our central park out of granite. 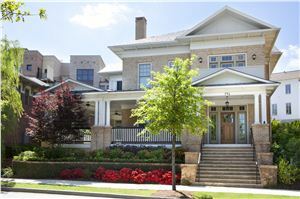 The Southern Living Idea House at Glenwood Park automatically calculates an irrigation schedule using landscape-specific parameters, then adjusts the irrigation schedule for each of the watering zones via satellite as local weather changes. Glenwood Park recycled 250,000 lbs of metals removed from the site and recycled 259,200,000 lbs of concrete (60,000 Cubic Yards), an amount equal to an acre of concrete at 36 feet deep! Glenwood Park reduced the amount of stormwater runoff from its site by two thirds and treats approximately 61,000 cubic feet of water (426,000 gallons) for every 1.2" rainfall. Glenwood Park has planted over 1000 trees and thousands of other plants, flowers, and shrubs creating shade and comfort, while also absorbing thousands of gallons of stormwater and significantly reducing heat island effects. The Glenwood Park pool building uses a geothermal system for its club house and nine units. According to the International Ground Source Heat Pumps Association, every geothermal unit installed eliminates an amount of CO2 equal to planting an acre of trees.